Ground floor: Open plan kitchen/dining room (oven, microwave, dishwasher). Double bedroom. Bathroom (no WC). Cloakroom (WC). Living room (Satellite TV) with French doors to terrace. Utility room (washing machine). Twin bedroom with en suite bathroom and French doors to garden. Heating throughout the house. WiFi. First Floor: Double bedroom with en suite shower room. Outside: Shady terrace and lawned garden, enclosed grounds. Private parking. Barbecue. Mas du Ciel is a beautifully renovated character property with contemporary designed interior complemented by several objets d'art that adorn the house. 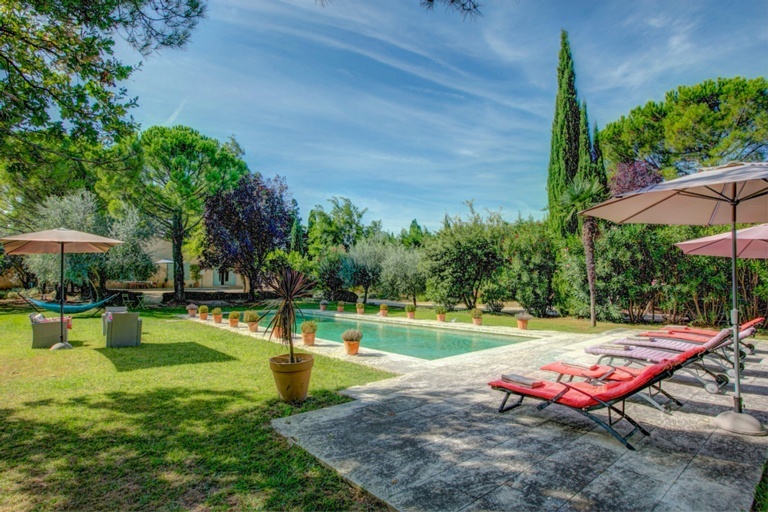 The property is only 2km from the fashionable village of Eygalières and a short drive from Saint-Rémy-de-Provence, with celebrated views made famous by the works of Vincent Van Gogh. The interior offers a stylish and mature sanctuary and will no doubt prove popular with adults and children alike. If you are not outside enjoying the Provençal sunshine, the spacious living room, with beautiful white stone floors and minimalist furniture, provides a haven for relaxation. The bedrooms have their own bathrooms, exposed stone walls and magnificent timber beams are a particular feature that helps retain the original lovely character within the house. There is plenty of space outside for games, a terrace for dining and best of all, the pool is 15m long and large enough for plenty of fun and a proper swim. Eygalières (2km) is popular with Parisians, artists and painters and is arguably one of the prettiest villages in the ‘Alpilles’ mountains that provide its backdrop. There is a Friday market when the cafés and bistros become lively with locals. ‘Les Alpilles’ are lovely for walking and its villages are quintessentially Provençal. We recommend a visit to Les Baux-de-Provence in particular (22km), a medieval village built on a spectacular rocky outcrop, and Arles (30km) with its Roman treasures, shady squares and Camarguais culture. • The property is semi detached and part of a small hamlet of neighbouring houses. • There are low windows on the first floor - care with children is needed. Take a stroll from the bottom of the village to the clock tower at the top, passing houses built from the local limestone with carved doors, a number of chapels and the remains of a castle keep. Visit on Friday morning to peruse the market stalls with the locals, and why not finish off with a spot of lunch. Garden lovers will no doubt wish to visit 'Les Sentiers de l'Abondance' in Eygalières, landscaped gardens with a focus on aromatic and medicinal plants, and 'Le Jardin d'Alcinoos' in St Rémy, a private botanical garden dotted with artworks and scultures. This medieval fortress with gardens designed by Le Nôtre is situated between Salon de Provence and Aix en Provence. Built in the 11th century on a rocky peak, the chateau was impregnable, and belonged to successive families including royalty. The Château has become the setting for events: heritage days, candlelit tours, medieval banquets and shows. It is also lived in and fully furnished, and can be explored by guided tour by costumed guides. The gardens are open to the public on certain days and include ponds, fountains, statues, and even a 30-metre long underground passage. Near Salon de Provence, this zoo is set in a 33 hectare forest and has over 600 animals of more than 120 different species. Many large mammals, as well as reptile and bird collections. Why not combine with a visit to the Chateau nearby? at the Paintball and Laser game centre in St Rémy! Enjoy a family day out on a hot day at the water park in Monteux. Ride the surf simulator 'Da Wave', cool off in the pools and water slides, and explore the Adventurers' Castle playground. Come face to face with nearly 400 animals of 80 different breeds at the Ferme de la Gallinière. Donkeys, cows, horses, rabbits, goats, sheep, turkeys, geese, hens, pheasants, peacocks and many others. You can take a picnic to eat thre, and go on horse and cart or pony rides. Situated between Avignon and Orange. These Roman ruins near Saint-Rémy date back to about 100BC although it is thought there was a native population here from about 500BC. Around 260AD, the town was destroyed by barbarian invasions but the survivors founded a village nearby that was to become Saint-Rémy-de-Provence. The ruins were uncovered in the early 20th century, and include some superb classical architecture. may like to visit the 'Musée Automobile de Provence' in Orgon, which traces a century of mechanical history from the bicycle to the car. Includes some lovely old cars and vintage posters etc. The 18th century Estrine Hotel in St Rémy was built to house the Princes' Judicature headquarters. Nowadays it houses the Estrine Museum, dedicated to Vincent Van Gogh. Visitors can find out about this exceptional artist, who lived in Saint-Rémy for a year, and his influence on 20th and 21st century art. The museum's permanent collection also includes work by other artists such as Bernard Buffet and Albert Gleizes, and there are two or three temporary exhibitions a year. 'La Petite Provence du Paradou' is a sweet 1/6 scale model Provençal village inhabited by about 400 figurines, posed in different traditional scenes of daily life, at the farmhouse, the laundry, the market etc - marvel at the details! Near to Les Baux-de-Provence. This town in the Rhône Valley is renowned and revered around the world for its quality wines, and you can learn more about winemaking in the area at the Maison Brotte winery and museum. At this museum in Graveson, you can learn about how perfume is made, see the stills and other equipment, enjoy a stroll in the aromatic herb garden, buy organic essential oils and diffusers, and even get a massage! The Alpilles natural park, on your doorstep, is great for walking and mountain biking, as well as more adventurous activities such as climbing, quad biking, canyoning and via ferrata. There is a diverse range of landscape within the park and it is an important habitat for many species of flora and fauna. This unique natural site is worth a day trip. Join a boat trip through the unique Camargue landscape and look out for the resident horses, bulls and birds. Or explore on foot or by bike at the Petit Rhône Reserve. Visit the famous 'Pont d’Avignon' of the children's song, although only 4 of the bridge's original 22 piles are still standing so be careful where you dance! Also not far away is another very famous bridge, the Pont du Gard, a three-tier Roman aqueduct. The principal city in the region, Avignon’s historic centre includes a 12th century Romanesque cathedral Notre Dame des Doms and the 14th century Palais des Papes, an immense Gothic building with formidable walls up to 18 feet thick! There are, of course, also many restaurants and cafés, shops, parks and squares to explore. This gorgeous medieval village, which features on the 'Most Beautiful Villages in France' list, should definitely also be on your sightseeing to-do list! Set on a rocky plateau, there are superb views on a clear day down to Arles and the Camargue. There is some beautiful architecture to see, but also just a lovely atmosphere of an authentic Provencal village with pleasant terrace cafés and art galleries to browse. This former quarry has been converted into a multimedia centre, where still and moving images are projected onto all the walls and floors, offering a truly immersive experience! There are usually at least two shows to choose from, often exploring and showcasing the work of a visual artist, for example Picasso and Van Gogh in 2018.